Disney Villain Couples. 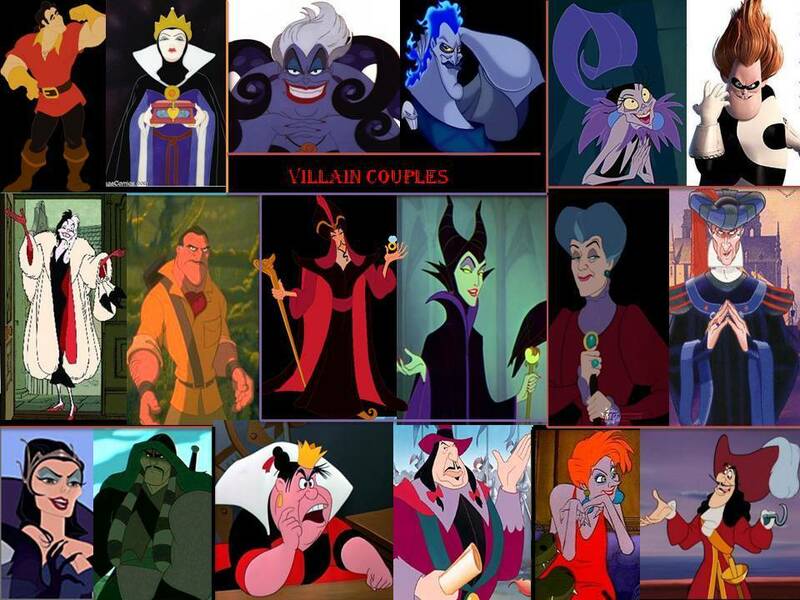 All the disnet villains paired off that i think would go together :). HD Wallpaper and background images in the Disney-Überkreuz club tagged: maleficent gaston ursula cruella hades jafar shan yu yzma captain hook. Boy this Liebe is supernatural, can Du feel it? ignore my last post i get who's with who. i'm not really a shipper for any couple in the pic except for frollo/lady tremaine but i still like this wallpaper anyway. yeah i'm pretty open minded about pairings. you couldnt put Vanessa With Gaston? I like Hades and Maleficent together and Vanessa and Gaston together. Captain Hook and Maleficent make a good couple and So do Jafar and Cruella De Vil. The evil Queen is older than Gaston is. Gaston is obnoxious, the evil Queen needs someone much more refined, say Governor Ratcliffe, Judge Claude Frollo, Emperor Shan-Yu, or the Horned King (though the Horned King would be better with one of the fates from Hercules). Vanessa is also Ursula, so that might not work. Both Judge Claude Frollo and Governor Ratcliffe would be good for Lady Tremaine (the wicked stepmother from Cinderella). I do not know who would be ideal for Drizella and Anastasia. Madame Medusa has two crocodiles, so that would not look good for Captain Hook. Captain Hook should be with someone, such as the evil Queen, Cruella De Vil, or the Queen of Hearts. Madame Medusa needs someone like Percival C. McLeach. Yzma should date Dr. Facilier (the Incredibles is Pixar). Emperor Shan-Yu can go jump in the lake, and "Enchanted" is part live action, so I do not think it counts. The Queen of Hearts is already married, but she would go great with Captain Hook, personality and role wise. Governor Ratcliffe is too refined for her, as is Stromboli from Pinocchio. Now, Cruella can date the King of Hearts, since she has a short, weak, and timid husband in the original "101 Dalmatians" book. @pyjamarama I don't like the Gaston and Vanessa pairing lol. I think that it's too forced; Gaston and the Evil Queen are both vain and conceited and once Gaston saw Ursula's true form he would have nothing to do with her. @disney1984 I agree with the Yzma. But Princess and the Frog was not out when i made this haha. I figured the reason that Hook would fall in love with Medusa is the fact that she has trained crocodiles hence teach him to get over his fear. I kinda don,t like the Madame Medusa and McLeach idea,actually,im concerned,bc what if it dosen't look good on McLeach? I'm only saying this because McLeach had a fear of crocodiles in his movie before he fell over the waterfall. And i just think if he were ever introduced to Madame Medusa's two pet crocodiles, they would remind him too much of the crocodiles that he nearly became a meal for. I tend to ship Maleficent with Hades because he had a crush on her in an episode of House of Mouse and she eventually agreed to go out with him. And most people ship Gothel with Frollo, although I have also seen YT vids of him with Lady Tremaine.